With 12-year-old Karina Heinold of Westford looking on, Joe Schlesinger enters a program for Sparki the robot. ArcBotics of Cambridge is using Kickstarter to raise money to fund production of the device. Forget about getting a dog. This Sparki will fetch and play ball, and it never barks. Sparki is a small, boxy robot that with a bit of programming know-how will even play a game of chase-the-flashlight-beam. The brain behind Sparki is a tiny Cambridge start-up called ArcBotics, whose founders have turned to the crowdfunding website Kickstarter to finance their mechanical companion for kids. So far, they have raised more than $17,000, about a quarter of the way to their goal. But Sparki isn’t just a toy. Its builders hope the small bot will inspire a new generation of robot makers­ and computer whizzes. ArcBotics joins a growing field of companies making educational robots that includes LEGO Group, which sells a brand of programmable robots, and Aldebaran­ Robotics, a French company that produces an advanced humanoid robot used in US classrooms. “As [computer] processors have become smaller, more powerful, and less expensive over the past ­decade, we’ve seen a huge jump in the types of educational platforms available,” said Holly Yanco, director of the New England Robotics Validation and Experimentation Center at the University of Massachusetts Lowell. The center opened earlier this year to serve as a testing and research facility for regional robotics companies. Sparki is designed for ages 11 and up. Kids will be able to write simple programs to make Sparki pick up small objects, draw shapes and words, or push around balls — and in doing so get them interested in electronics and engineering. Sparki comes with a remote control to manipulate the 4- by 5.5-inch, two-wheeled machine, but by plugging it into a computer, users will be able to input simple commands to make it move on its own. It’s outfitted with advanced sensors that detect light, enable it to judge distances, follow along edges of walls, and keep from falling off tables. Its small gripper in front opens to about four inches — wide enough to grab a bottle — and it comes with a built-in marker holder. It also has a buzzer that can pester a house pet — or parent — for hours. As of Thursday afternoon, 176 people had pledged on Kickstarter to support the Sparki project. For a $99 contribution, they will get their own Sparki once it goes into production. Going through Kickstarter does not guarantee success; many projects fail to meet fund-raising goals, and so don’t get any of the money pledged through the site. 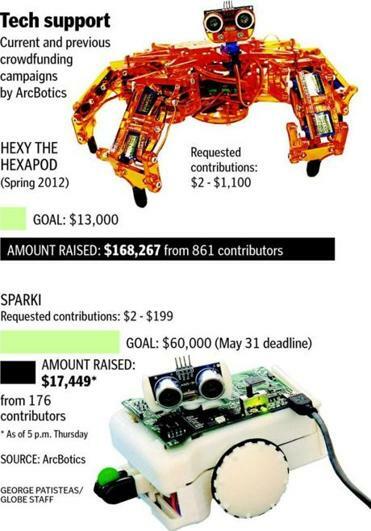 But ArcBotics has already made it big once before on Kickstarter, raising $168,000 last year for its first product, a $220 robot called Hexy the Hexapod. It set out to raise just $13,000. Hexy was designed as a teaching tool for the more advanced robotics enthusiast to learn how to program the six-legged, spider-like machine to move around or to dance. Some of those Hexy supporters are back to fund ArcBotic’s second outing. “This nation needs more students getting involved in science and math,” said Mike Huster, a robot hobbyist from Versailles, Ken., and one of Sparki’s first Kickstarter backers. Michael B. Farrell can be reached at michael.farrell@ globe.com.